Good cycling gloves, there is nothing better than testing them yourself. Cycling gloves, whether for MTB or road bikers, are also part of the basic equipment of a biker just like the helmet is. What makes gloves so important for cycling? It's very simple: A large part of the body weight weighs down on the hands when cycling. If you on top of that do not observe a proper hand position on the handlebar, you will quickly recognize it when the fingers become stiff and numb. That is the point when the nerves shut up, when the nerve cords in the hand bend get squeezed. Too much pressure on the heel of the hand can also result in uncomfortable pain. All those are reasons why good cycling gloves nowadays have several cushions at the palm and thus are protecting the most sensitive points of the palm preventing pain to develop. An occasional cyclist will certainly not recognize it all too quickly, but a frequent cyclist will quickly learn to appreciate the benefits of good, partially cushioned gloves! By the way, women are more often affected in terms of aching wrists and numb fingers, one of the reasons why manufacturers offer a large selection of bike gloves for women. Therefore, the differences are not only to be found in the size and fit for small women's hands. Those should be sufficient reasons not to choose cycling gloves according to their look but solely based on the fact that the gloves fit well and that you can cycle without any pain. Test reports of the major bike journals can be very helpful in this regard, but in the end it is your opinion as to the fit, which counts. On the one hand, the own preferences are important, whether short cycling gloves or rather those with long fingers. But the decision is also made based on their intended application. 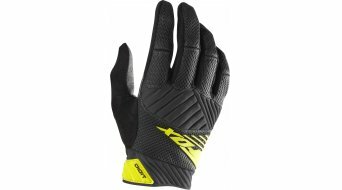 Those who are on the road with a lot of technology and ruthless, such as a downhill rider or a trail rider, will feel more comfortable with lightweight long-finger-gloves, even in summer. They offer additional grip on the handlebar and most of all on the brake levers. For good measure, they also protect the fingers from undergrowth and branches, through which you have to battle your way with the handlebar. In case of a fall, each of your fingers will also be better protected than they would been had you worn short gloves. In the meantime, it is self-explantory, that cycling gloves suitable for smartphone handling are also available. It is a fact that GPS units, smartphones, speedometers and Co are mostly operated by touch display nowadays. If you are using such electronics, you should consider that when buying gloves. Whether mountain bikers or road bikers, in summer, everyone also likes to rather use the shorter version. They should be airy and lightweight, made of thin fabrics, breathable and well cushioned at the pressure points. There are even gloves, which prevent the "creation of stripes" on the back of the hand (Roeckl Solar) by means of a solar function. Or one chooses Hirzl Grippp gloves suitable for water, which promise you the perfect grip on the handlebar even if the gloves are soaked in water. While you can just pull them off by the tips of the fingers when dealing with long finger gloves, taking off short gloves often proves to be difficult. But also in this case, the manufacturers came up with an idea. Short finger gloves with pull-off system: On the inside of the fingers, small loops help pushing the tightly fitting gloves into the direction of the fingertips. Quite helpful, the features gloves are offering nowadays! A good pair of winter gloves for MTB or road bike riding offers more than just closed, long fingers. It also protects against the coldness, wetness and sub-zero temperatures. If it gets bonechilling cold outside, the blood first of all pulls back from the fingers. The fingers are rather quickly frozen and it does not take long for them to become numb! Lined winter gloves for cycling offer suitable protection from the coldness by means of additional lining, fabric layers, and cushioning, but please do not exaggerate! If the gloves are too thick, it will rather quickly impact on the feeling for the handlebar, the brakes and the gear system. New are 3-finger cycling gloves, which provide more warmth through the fingers not being completed separated. Great for cold winter days, even if they might need some getting used to. You can even find some mittens which keep the hand - except for the thumb - closed. Whether MTB gloves, downhill, motocross gloves (MX), women's gloves or cycling gloves for children. Discover the top brands in our offer!